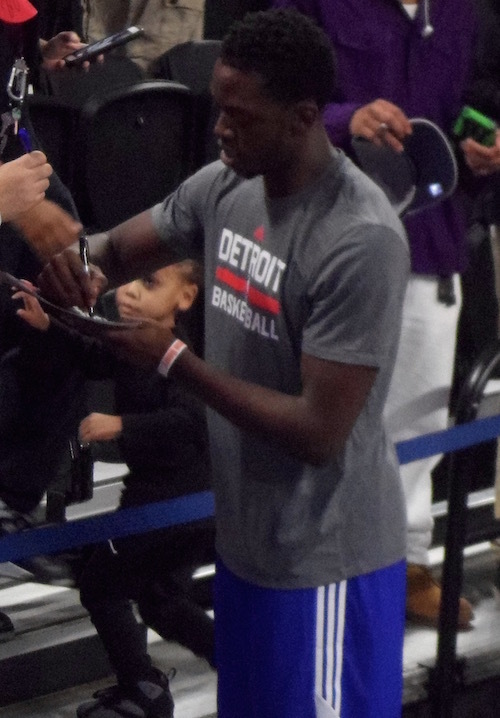 Here is an original photo of Pistons guard Reggie Jackson signing autographs at The Palace of Auburn Hills. The scene was captured by iFolloSports.com Michigan correspondent Lance Martinez. Since arriving in Detroit last February, Jackson has emerged as a legitimate NBA star. After averaging no more than 13 points per game, during his 3.5 years with the Thunder, the 25-year-old boasts of a 22.7 points per contest average this season, along with 4.1 points and 4.0 rebounds. Sunday, Jackson posted a career-high 40 points. In addition, Pistons fans can check out this photo of Jackson signing, earlier this year, in suburban Detroit.